This is one of my favorite salads. It's really easy to make and perfect every time. Filled with crisp apples, bacon, toasted walnuts, dried cranberries and chunks of blue cheese, what's not to love. It's an Ina Garten recipe, so you know it's a good one! 2. Place a baking rack on a sheet pan and lay the bacon slices on the rack. Roast the bacon for about 20 minutes, until nicely browned. Allow to cool. 3. 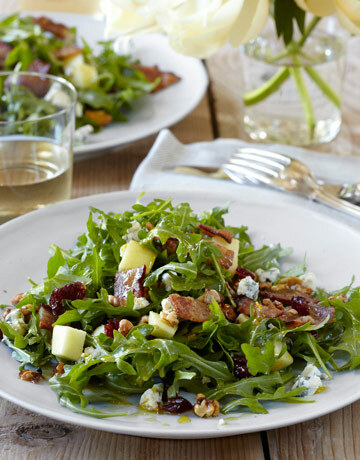 In a large bowl, toss together the arugula, apple, walnuts, cranberries, and blue cheese. For the dressing, whisk together the vinegar, orange zest, orange juice, mustard, maple syrup, 1 1/2 teaspoons salt, and the pepper in a bowl. Slowly whisk in the olive oil. 4. Chop the bacon into large pieces and add it to the salad. Toss the salad with just enough dressing to moisten. Sprinkle with 1/2 teaspoon salt and toss well. Serve immediately.